New Google Bar on Google.com website should be live for all users in coming weeks. New Google Bar design is simple yet stylish with single drop down menu box containing all options for various Google services. In new version of Google Bar, just mouse hover Google icon at top left side to see drop menu containing beautiful visual buttons for every Google service. New Google bar is competely different from current design and resemble interface of Google+ Plus service. By default, drop meny show options in order – You(Google+), Search, Images, Maps, Youtube, News, Gmail, Documents and More. 1. 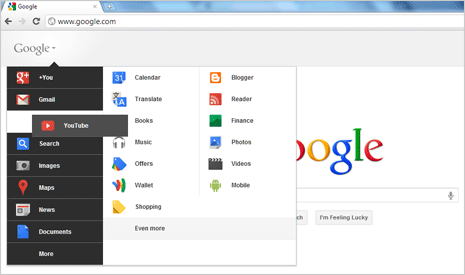 To enable new Google Bar and customize options, open Big G Drop Down Sorter extension in Google Chrome browser. Click Add to chrome to download and install this extension. Once extensions is installed, refresh Google.com homepage. 2. You should see new Google Bar now and hovering mouse over Google button at the top will show menu with various options. 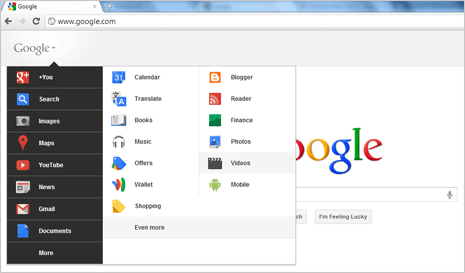 Besides activating new design of Google Bar, this extension also allows you to customize order of options in drop menu. Just drag and drop items in the drop menu and create customized order for options appearing in the menu. For example, user with extensive usage of Gmail and Youtube can drag Youtube and Gmail options at the top for easier and quicker access. You may move rarely used Google services options in More sub menu and have visibilty of often used options.